India American Cultural Association (IACA) organized its gala 17th annual Festival of India, to celebrate India’s 67th Independence Day, at the Gwinnett Center on Saturday and Sunday, August 24 and 25, 2013. 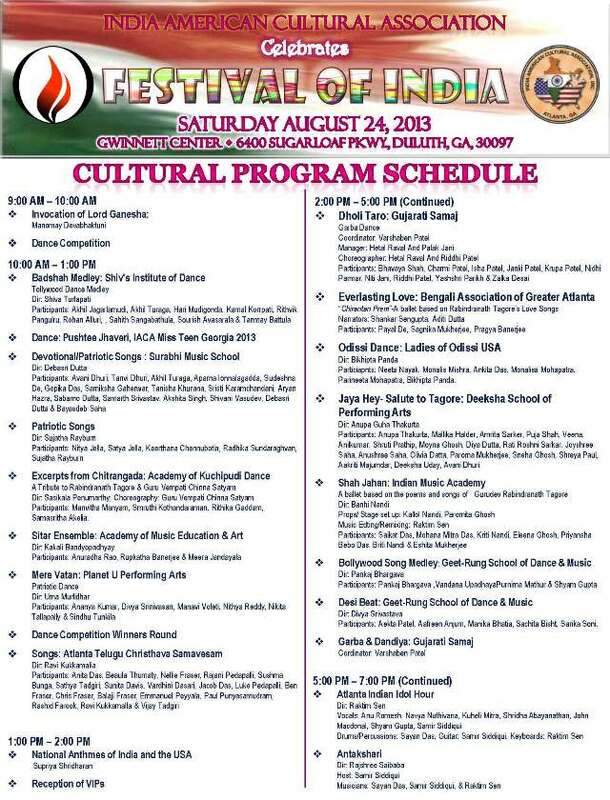 The Festival was celebrated with enthusiasm by over 5000 of the Atlanta community. Sunday afternoon's visit by social activist Padma Bhushan Shri Anna Hazare added special flavor to the rich menu of an entertaining and engrossing program. 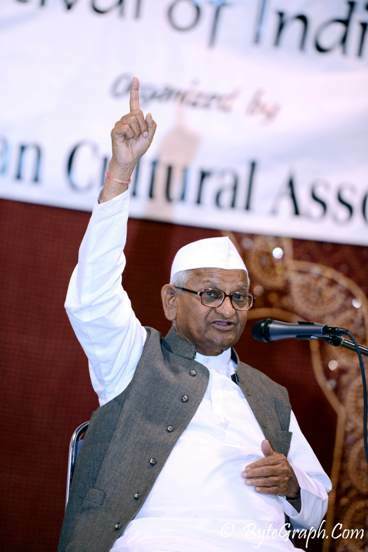 Shouts of "Vande Mataram" and "Bharat Mata ki Jai" rose as Anna Hazare was enthusiastically greeted by the crowd. "Main Jan Lok Pal to lagoo kiye bina nahin maroonga," Hazare declared ("I am not dying before the complete implementaion of Jan Lok Pal bill"). He explained how he used his Padma Shree and Padma Bhushan award money to open a trust that helps poor people get married. President Tripathi asked, on public's behalf, "You have 120 crore Bharatwasi with you, but you don’t have 542 lawmakers (MP's) to support you. How can you change or implement anything?" Anna replied that he is creating public awareness which will help win over enough good lawmakers to his side, to enable him to accomplish his mission. Senior leadership of IACA presented a bouquet to Annaji and joined IACA President Kaushal Tripathi and Annaji in singing India’s national anthem, led by Supriya Sridharan. Tripathi addressed the crowd, announcing that this year’s celebration honored Indian-Americans as the fastest growing community in America. This is also a year of centennials, for Indian cinema; the Gadar Party—formed to free India; the 150th birth anniversary of India’s Nobel Laureate Rabindranath Tagore; and the 150th birth anniversary of Swami Vivekananda. IACA, he said, is the biggest Indian organization and represents the 120,000 strong and growing Indian diaspora of Georgia. We take immense pride, he declared, in adding diversity to the many ethnic communities in Georgia. We constantly endeavor to unify our communities to act together and give back to the community. 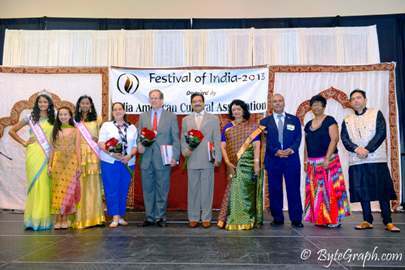 This year IACA organized its 28th beauty pageant and first Atlanta Indian Idol Contest. Atlanta is our home—let us build a happy, harmonious community, he concluded. IACA Chairwoman Paddy Sharma introduced Chief Guest Jack Kingston, U.S. Representative – 1st Congressional District of Georgia, with his wife Libby. He was accompanied by Chandra B. (CB) Yadav, a small business owner in Camden County who serves on the Chamber of Commerce and Kingsland Tourism Boards and the Kingsland Downtown Development Authority and who was sworn in on August 1 by Governor Nathan Deal to a statewide board of the Georgia Lottery Commission. Congressman Kingston recognized Shi Shailendra, Chandrakant (CK) Patel, and others, and then spoke of his visit to India, trade opportunities, the need to work together in preserving the environment and in partnering for world peace and stability. Consul General Ajit Kumar congratulated IACA for organizing the Festival for the past sixteen years: "The attendance and enthusiasm of the people here shows the success that IACA is having with these festivals." He noted that India is "closely associated with the U.S. through the ‘Green revolution.’ Thanks to agronomist Norman Borlaug‘s high yielding wheat, India today is the second-largest exporter of wheat and number one exporter of rice in the world." He praised the community, and spoke of the consulate's mission of serving, forging people-to-people relations and trade relations between our countries. Josephine Tan, former Chair for the Asian American Commission for a New Georgia, and IACA officers past and present spoke or were recognized. Congressman Kingston presented plaques to the following awardees: IACA’s past Board member Manohar Singh; Exec. V.P. Nivedita Garabadu; V.P. Rina Gupta; in absentia, President of Aligarh Alumni Association Mr. Nomani, Chand Akkineni, Paddy Sharma, Raktim Sen, and Narayan Swamy. Booths were busy selling goods or providing information. One booth even sold mango pickles, murabba, and chhundo! Atlanta’s popular Madras Saravana Bhavan, Udipi Café, Mohan Chat, and Bangkok Thai Restaurant did a brisk business selling mouthwatering food and beverages. 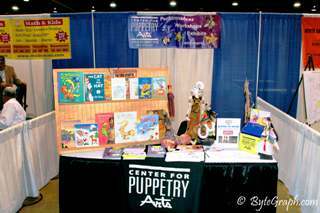 Booth-renters were happy that the stage for the cultural show was in the same hall, as it drew more public to the booths. A riveting two-day cultural program had participation by talented and excited participants in colorful Indian dress. The large audience enjoyed a huge variety of songs and dances by individuals, groups, and schools of music and dance. Styles ranged from devotional and patriotic to Indian Idol, and from bhangra and garba to Odissi, including several tributes to Tagore and a dance competition. The Youth Forum on South Asian Health, moderated by Kritika Subramanian, discussed lifestyle choices, diabetes, and social empowerment. Dr. Sudhanva Char; Dr. Inuka Midha; Dr. Raju Midha; and Dr. Rony Jose of the Rollins Association of South Asian Health (RASAH) spoke of how the South Asian community can approach its particular needs. Lively discussion ensued. Elementary school students recognized the “my plate” food planner from their health classes, and older audience members inquired about healthy practices when traveling. The "Diabetes and its impact on our community" seminar was well attended. Dr. Nazeera Dawood of Fulton County Health and Wellness described health resources for South Asians. She stressed the importance of gaining influence in city/state governments to allocate more resources on preventive care and support services to South Asians. Panelists included endocrinologist Dr. Sharvari Rangnekar, cardiologists Dr. Sreeni Gangasani and Dr. N. Neelagaru, dietician Sudha Reddy, and diabetes educator Vicki Karnes. Rabindra and Shoma Chakraborty organized a discourse on ‘Relevance of Swami Vivekananda' by Swami Ishtamanandaji of Ramakrishna Mission, Chicago. They also showed their own documentary film Where the Mind is without Fear for the 150th birth anniversary of Rabindranath Tagore. A "Kids' Mock Cooking Competition" was presented for the first time with the help of Fulton County Healthy Heart Coalition. Moderated by Usha Swamy, it warned away from foods heavy with salt, sugar, and fat that lead to obesity, diabetes, and other chronic diseases, and taught about healthy diet and food preparation as an enjoyable art. 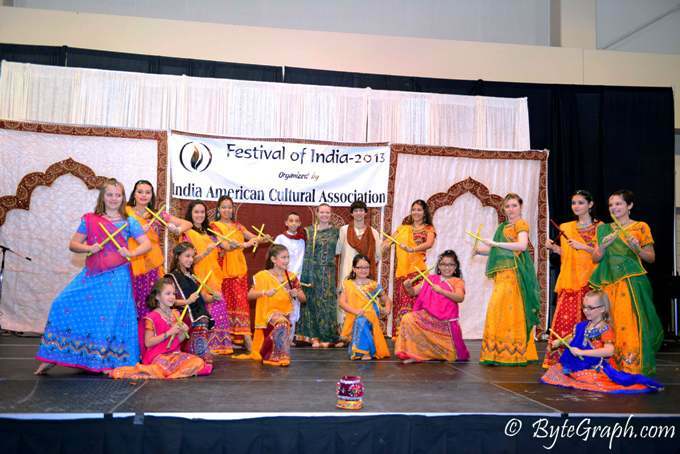 The Festival of India, which began in 1997, has now become a much anticipated and appreciated annual event, as it provides an invaluable glimpse into the rich and vibrant culture and heritage of India to Atlanta’s fast growing young Indian generation as well as to the mainstream communities. Chand Akkineni, Kaushal Tripathi, Ani Agnihotri, and Paddy Sharma did an outstanding job helping out with the Cultural program, meeting with the dignitary guests including Shri Anna Hazare, recognitions and bestowing awards. name a few. Sanatan Mandir volunteers Chaitanya Bhatt, Badri Joshi, Ashok Patel, Jayanti Patel, Suvas Patel, and Navnit Patel manned the popular booth with Anna Hazare caps and T shirts. The Festival was also marked with the prominent presence of long–serving members of IACA, Narsi Narasimhan, Chaitanya Bhatt, Vir Nanda, Ramanbhai Patel, and Mustafa Ajmeri, to name a few.